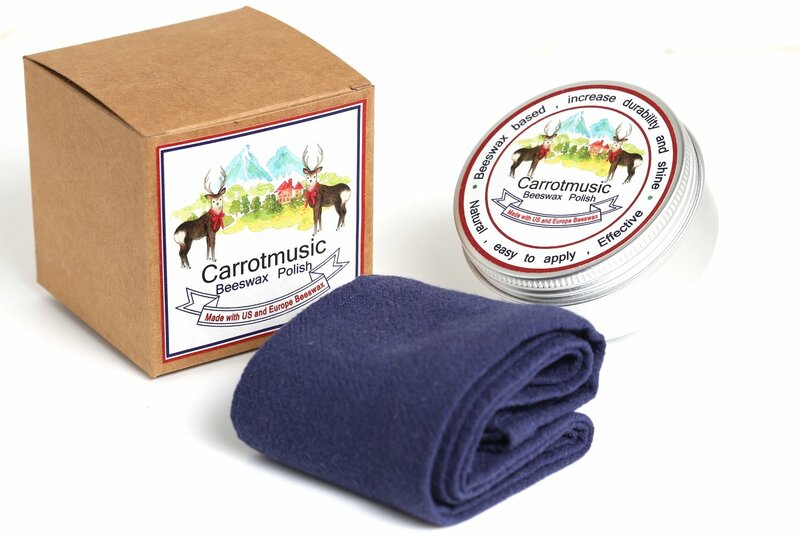 Our New Beeswax Polish is carefully formulated to provide better protection and shine for Carrotmusic bamboo flutes. Apply Beeswax coating regularly, especially before storing the flute away for prolonged period can help minimize the bamboo flute's contact with natural substances, hence decreasing the chance of cracking and other element's attacks. This formula is repeatedly tested and formulated with Carrotmusic bamboo flutes, which all consist of our proprietary formulated coating. To obtain best result, this wax polish is recommended for Carrotmusic bamboo flutes. For other bamboo flutes that use different varnishes and finishes, our polish may not adhere as well to those flute coatings. 100% natural ingredients. Made with freshly harvested Beeswax from small chemical free farms in USA and Europe. Comes with a pure Linen polishing cloth. Linen is one of the strongest natural fibres and is resistant to molding, which makes it our firsh choice for a durable polish cloth. Carrotmusic Model BFP001 Bamboo flute Beeswax polish. Model number: BFP001. Origin of ingredients: United States, Italy, Bulgaria, Morocco, Japan. Direction: Apply a thin layer regularly on your bamboo flutes. Store in cool dry place and away from direct sunlight. 100% natural. Ingredients: Beeswax,Organic vegetable oils,Carnauba wax, Essential oils. Net Weight of the polish: Around 80g. Free accessory: 1 piece of Pure linen Polish cloth.